We love drinks with Chartreuse so we are always on the lookout for when this ingredient pops up on a menu. There are a few bars around the country that have featured this drink because it's another masterpiece from the Violet Hour's Toby Maloney. We've been hanging on to the recipe for the Poor Liza for years but haven't been able to make it because we lacked the base spirit. It requires Poire William, or Bartlett pear brandy. Not to be confused with pear liqueur, this is a dry eau de vie—a true brandy made from whole fruit, fermented and distilled. Here’s a simple little cocktail that takes a bunch of ingredients we’ve described before and combines them into an unexpected party of flavors. Pooling dry gin with lime, liqueur and bitters isn’t new. 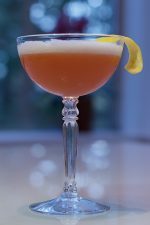 We have seen this formula before with the Pegu Club cocktail, but the Pendennis is different. It’s—dare we say it—better? more interesting. To be fair, we can’t count how many times we’ve said that one recipe or another was our favorite. Ask us our favorite cocktail and we will probably ask you what base spirit you had in mind. So let’s give credit where credit is due and call this a Pegu Club variant, but one you really must try.